New low-CO2 cars for Hyundai | What Car? 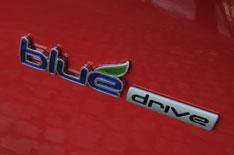 Hyundai is to introduce new Bluedrive eco-badging for low-emissions cars, and will launch three sub-100g/km models in 2011. The i10 city car, i20 supermini and i30 small family car ranges will all include new low-CO2 versions. This means that all the cars will have average economy figures of at least 64mpg. With emissions of less than 100g/km, the cars will be exempt from vehicle excise duty and London's Congestion Charge. Companies will also be able to write down the cost of the cars against tax.